Fueled by advanced analytics, proprietary data and individual consumer preferences, NitroScore creates personalized rankings of college and major choices - based on the predicted ability to repay student loans after graduation. NitroScore is backed by real-world college cost data and projected post-graduation salaries, allowing students and their families to compare schools, financial aid offers, and majors to identify their most affordable option. NitroCollege.com provides unparalleled insight into the complex and difficult to navigate world of college finance. NitroCollege.com answers all questions about college financial aid and borrowing in direct, understandable terms. 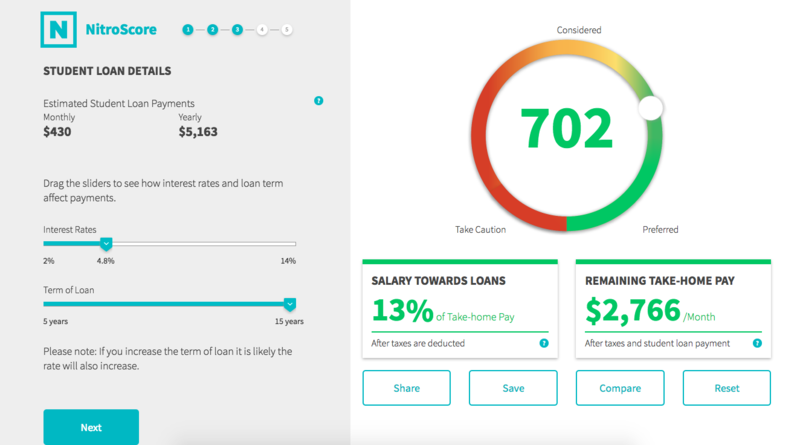 NitroScore is our latest breakthrough tool, designed to create better borrowers by providing families and prospective college students with deep insights into how picking one college or major over another might impact their ability to repay student loans. With NitroScore, anyone can compare the value of a college education and pick those schools and majors most likely to lead to a good paying job, reducing credit risk for our clients. NitroScore is part of our commitment to taking the mystery out of investing in a college education. We understand the risk faced by young people when borrowing for college. Our goal is to help them ensure a better financial future by choosing the highest value schools and majors.